Do you want to understand jihad in America? The threat is just beneath the surface – hidden in plain sight. It becomes more obvious at certain moments – like today when young Muslim Chechnyans are involved with police shootouts when they are connected with the tragic Boston Marathon bombings. But it's there every day – right in front of us. If you want to understand this threat, perhaps the best documentary primer is "Jihad in America" by Steve Emerson, a former CNN newsman. He calls it "The Grand Deception." This 70-minute documentary unmasks the covert infrastructure of the Muslim Brotherhood in the United States, shows how its leaders rose to prominence and exposes how they continue to exploit American values – under the cover of religion – to further their ulterior political agenda. Based on an extensive collection of primary source materials, including internal records of the Muslim Brotherhood, startling first-person accounts and chilling and exclusive undercover audio and video of these groups behind closed doors, this investigative film lays bare the history and secret structure of this subversive menace behind the public mask. Here's what people are saying about "Jihad in America." 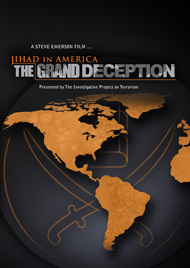 "You cannot watch this without realizing there is a Jihad plan in America. Steve Emerson has investigated this subject in a remarkable way! He uses 'their own words' on video to show the plan they have against the United States. What they say is so insightful. I have seen many videos like this, and this one is the best; the DVD is brilliantly done." – ElliottJFM, Pittsburgh, Pa.
Steve Emerson is the executive director of the Investigative Project on Terrorism, one of the world's largest storehouses of archival data and intelligence on Islamic and Middle Eastern terrorist groups. Emerson and his staff have been quoted or profiled in hundreds of newspaper and television stories since 9/11 and frequently provide briefings to U.S. government and law enforcement agencies, members of Congress and congressional committees. Emerson has testified before and briefed Congress dozens of times on terrorist financing and operational networks of al-Qaida, Hamas, Hezbollah, Islamic Jihad and the rest of the worldwide Islamic militant spectrum. Emerson is the author or co-author of six books on terrorism and national security. Order your copy of "Jihad in America" today from the WND Superstore.